The lovely people at the Australasian College Broadway in Sydney, have been kind enough to give me two beautiful hair treatments to give away to two lucky readers! 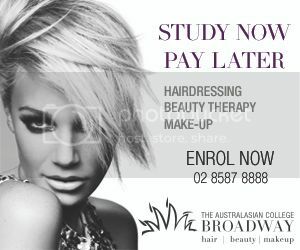 Each treatment is valued at $60 and the winners will be spoilt with a wash, blow-dry and hairstyle at the College's beautiful salon. If you would like the chance to win one of these luxurious treatments, please enter via the Rafflecopter app below.